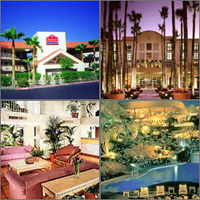 Compare discounts for Hotels Motels Resorts in Tempe, Arizona! Located east of downtown Phoenix, Tempe is home to Arizona State University (ASU) and has a young college town atmosphere. Mill Avenue at the center of Tempe is the main shopping and nightlife area. A thriving waterfront scene is growing up around Tempe Town Lake, already fun for kayaking, canoeing, and boat tours. Tempe offers easy access to Phoenix Sky Harbor Airport and to downtown Scottsdale and Sun Devil Stadium. Note: Lists are not identical. Different sites offer different accommodation options for Tempe. Situated on a 25-acre mountaintop landmark, overlooking the city of Phoenix and Valley of the Sun, The Buttes, A Wyndham Resort, is a natural, magical setting for leisure, group business and family travel. Situated on a 25-acre mountaintop landmark, overlooking the city of Phoenix and Valley of the Sun, The Buttes, A Marriott Resort, is a natural, magical setting for leisure, group business and family travel. A beautiful full-service corporate hotel, the Sheraton Phoenix Airport Hotel offers a fabulous location and features complimentary 24-hour airport shuttle service, a full service restaurant, room service, a gift shop, luggage storage and complimentary parking. Fiesta Inn is an independent resort offering 270 newly refurbished Southwestern style guest rooms located on 33 lushly landscaped acres in the heart of metropolitan Phoenix. The award winning Hawthorn Suites Tempe has everything the corporate or leisure traveler could possible require. The Best Western Inn of Tempe is located two miles east of Sky Harbor International Airport on Scottsdale Road, close to a wide variety of activities. Watch the Phoenix Suns play at the Sun Devil Stadium, or take a leisurely walk at the Papago Park, just minutes from the hotel. The Executive Suites Extended Stay Tempe has 140 large one bedroom suites and is located 4 miles to the Phoenix Sky Harbor International airport. The newly renovated Quality Inn ASU Airport is situated adjacent to the ASU campus. This hotel is located in the East Valley adjacent to Phoenix, offering the perfect location for business and leisure travelers as well as visitors to Arizona State University. Comfort Inn and Suites Tempe ASU Airport offers 72 new, spacious rooms and suites with a clean relaxing atmosphere, superior service and all at a comfortable price.